Preheat oven to 350 degrees F. Grease a tart tray with removable bottom or a pie pan. In a large bowl mix together the two flours, sweetener and sea salt. Stir in melted butter, egg, and vanilla. The dough will be crumbly. Just keep mixing by pressing and stirring until it is smooth and uniform. Press the dough into your tart pan or pie tray. Poke holes in the surface with a fork to prevent bubbling. Bake for 10-12 minutes until golden brown. Place chocolate in a medium-sized bowl. In a pot add coconut milk and vanilla and heat until just about boiling. Immediately add coconut milk to chocolate and stir until creamy and smooth. 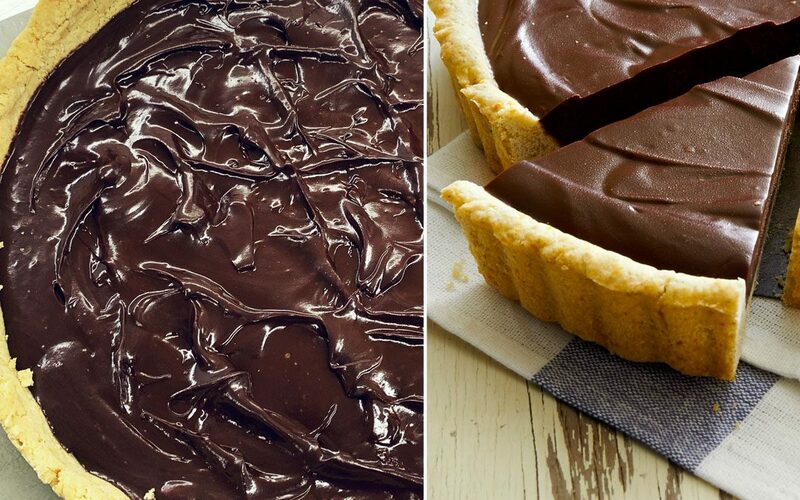 After crust has baked and cooled, add warm chocolate ganache to pie pan. Rest in fridge for 2-3 hours until chocolate solidifies. Cut into 16 equal pieces and serve chilled.